Our ambition with the Riksgränsen Banked Slalom is to celebrate and enjoy snowboarding in it’s purest form. We do it where several chapters of snowboarding most prominent history has been written. Even though everyone competes against each other the scream’s of stoke and warm smiles fill the air around the competition. There’s no sour faces or bad mouthing just a collective high that fuels the event. The course is located under the main chair lift which gives you a great view over all the turns. In addition to the competition we present a photo exhibition about snowboarding in Sweden today. 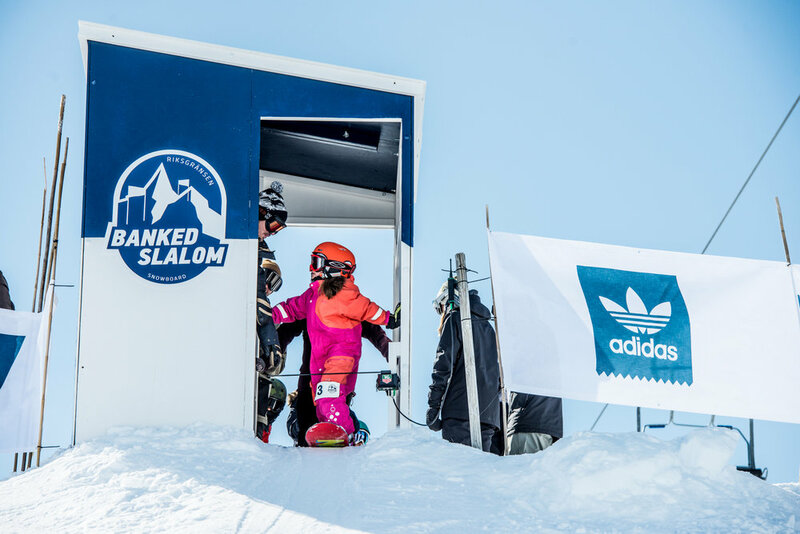 We bring generations of snowboarders together in a unique way. For some it’s their first time back since they we’re kids in the 90’s, others bring their kids to experience the light and the atmosphere with them, but most of us see this as something that speaks to their soul as snowboarders. The Riksgränsen Banked Slalom is a melting pot for Scandinavian snowboarding where we create new visions and resurrect old legends. We move forward to our fifth year with a goal to make our guests visit better, grow the event with care and make sure that the stoke’o meter for snowboarding is in the top.